INDIANAPOLIS (CNS) — Brenda Martinez’s first dream was to become an astrophysicist. As she finished seventh grade in Indianapolis, her heart was set on attending Purdue University with the help of a state scholarship program. But in one crushing blow, she learned she was “undocumented,” which made her ineligible for the financial assistance and dashed her hopes that her dream could become real. “That’s how I started being cautious about dreaming,” Martinez told Catholic News Service Jan. 4. Now 25 and a member of St. Monica Parish in Indianapolis, Martinez fled as a 6-year-old from the bleak and dangerous city of Ciudad Juarez, Mexico. The border town has been wracked by violence for years as rival gangs battle for valuable drug trafficking routes and rule through fear. “Women were getting kidnapped and they were getting raped and murdered and being dumped next to the border. It would be every other day, every other day,” Martinez said. “It was scary because my mom was working the second or third shift and that’s when people would go missing,” she said. A robbery at her grandparents’ butcher shop, where she and her younger sister stayed, was the final incident. Her godparents, already residing in Indianapolis, insisted that Martinez come to live with them. Leaving her mother and sister behind, Martinez grew up in relative security until the crushing day when her godmother explained that she was undocumented. 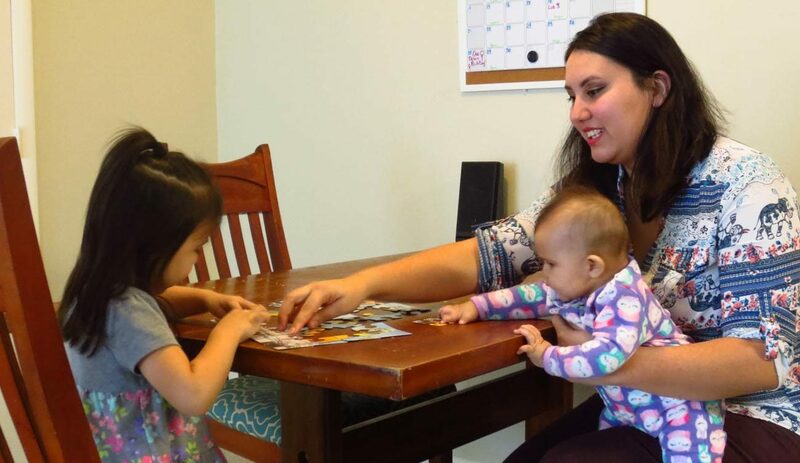 Martinez did not feel that her situation fit the narrow criteria to apply for permanent residence or citizenship and lived in constant fear of deportation, unable to legally drive or work. A glimmer of hope appeared in 2012 when President Barack Obama enacted DACA, or Deferred Action for Childhood Arrivals. Although not a path to citizenship, DACA gave about 800,000 young people like Martinez renewable two-year permits to legally work, acquire driver’s licenses and attend college. “I felt safer because I could finally have a job and work and make something out of my life here,” she recalled. Martinez enrolled in a local community college and worked low-wage jobs to pay for tuition and books. She acquired a business certification and then paused her college education to give birth to her first daughter, Luna. Five months ago, she and her husband welcomed a second child, Athenea. Martinez decided to stay home to care for the girls. “(My husband) works from 7 a.m. till 5:30 p.m. and from there he starts working at 6 or 7 p.m. at the other job and he doesn’t come home till 1, 2, sometimes 3 a.m.,” she explained. “Hopefully, once I start working again, he can leave one of the jobs. But that’s how we were taught, so that’s how we’re living right now,” Martinez said. Yet even that plan might be dashed. President Donald Trump announced the end of DACA in September, which means Martinez’s permit to live and work in the U.S. cannot be renewed. Her permit runs out in March 2019 unless Congress passes the Development, Relief and Education for Alien Minors Act, or DREAM Act. “I don’t know what’s going to happen. I don’t know if they’re going to tell me to get my stuff and I have a certain amount of time to get out, I don’t know if they’ll offer me another way to have another job permit,” she said. “I would be really devastated if I would have to leave and if they told me that I can’t take my children with me because they are citizens and I’m not. That is my main worry: that I won’t be able to take my children with me,” she said. “It’s hard to think about losing the Dreamers in our community,” said Sister Tracey Horan, a community organizer with Faith in Indiana and the Archdiocese of Indianapolis’ point person on immigration issues. “To me, it feels like losing a generation of young adults who have fire and passion to create something new. We can’t even calculate the cost of that,” said Sister Horan, a member of the Sisters of Providence of St. Mary of the Woods in Indiana. Unless Congress acts on the DREAM Act by early March, the first permits for people protected under DACA will begin to run out. An estimated 1,000 Dreamers would lose their status each day. “I just would like them to realize that it’s a lot of lives they have in their hands right now that are kind of hanging by a thread,” Martinez said.